MARLBORO, Vt. – Tucked away in a small Vermont college town, Marlboro Music is doing what it has done for most of its 62 seasons: giving a handful of very talented musicians the chance to immerse themselves in a selection of pieces old and new. Only a few of the many works rehearsed each week are played in concert, so in most cases there is time to work and rework them, without the pressure of public performance. The music presented in concert is often of a very high order, and that was the case during the festival’s fourth weekend of concerts. The two standout performances were of Beethoven quartets. While the festival is often thought of as fixated on the Austro-German tradition, it was significant that the Beethoven works were all receiving their first Marlboro performances. On Saturday it was Beetho­ven’s Quartet in D major (Op. 18, No. 3). Many groups succumb to the tendency to overplay Beethoven’s young works, to show that the complex genius of his later music is foreshadowed early on. But here, the four performers — violinists Elena Urioste and Joseph Lin, violist Vicki Powell, cellist Angela Park — put a premium on lightness, transparency, and a sense of proportion that made it feel like the youthful work it is. There was also a flexible approach to rhythm and perfectly calibrated dynamics. It was a deft and sophisticated reimagining of impossibly well-worn repertoire. Sunday’s Beethoven was the Quartet in B-flat (Op. 130), with the Grosse Fuge (Op. 133) as the final movement, as Beethoven originally intended it. Playing the piece this way creates about an hour of treacherously difficult music that can trip up the best ensembles. In comparison with the Op. 18 performance, this one was more orthodox, especially in its rich, earthy string tones. But what a performance! The foursome — violinists David McCarroll and Joel Link, violist Hélène Clément, and cellist Marcy Rosen — played with near-flawless technique, rapport, and pacing. Just as important, there was a gripping sense of drama throughout the performance that almost came unhinged during the Grosse Fuge. This was, quite simply, one of the most exciting Beethoven performances I can remember hearing. A Marlboro representative mentioned that it had been rehearsed for 47 hours; I can report that it was time well spent. There were, of course, other works played during the weekend. Unusually, both concerts opened with music by Hindemith. On Saturday it was the Quartet for Clarinet, Violin, Cello, and Piano, a somewhat austere work with much sophisticated counterpoint. 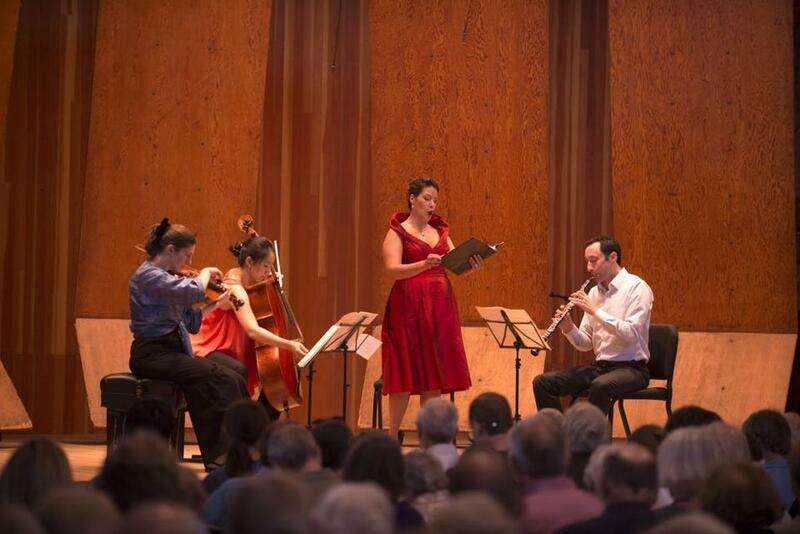 On Sunday it was “Die Serenaden” for soprano, oboe, viola, and cello, which created shifting textures among the singer and instruments for each song. Pianist Ignat Solzhenitsyn anchored the Quartet; Kim Kashkashian of New England Conservatory was the superb violist on Sunday. And there was French music. Fauré’s G-minor Piano Quartet was the program closer on Saturday, an ardent sample of French Romanticism full of long, declamatory melodies. Sunday offered Ravel’s “Trois poèmes de Stéphane Mallarmé,” which telescopes the palette of an orchestra into a nine-piece ensemble of piano, winds, and strings. The instrumental coloring is exquisite, a quietly dazzling backdrop for Mallarmé’s dreamlike poems. Naomi O’Connell was the outstanding mezzo-soprano, her voice cool, precisely controlled, and perfect for this music. They were all fine performances, the Ravel especially so. But the weekend belonged to Beethoven. The festival’s final concerts are this weekend.